Nichkhun, member of Korean boy band 2PM, has been recognized as the most influential person at the 1st Annual Kerd Awards in Thailand. The Kerd Awards selected the most influential people in the Thai entertainment industry. The awarding ceremony was held on March 30 at the Grand Ballroom of the Crystal Design Center in Bangkok. 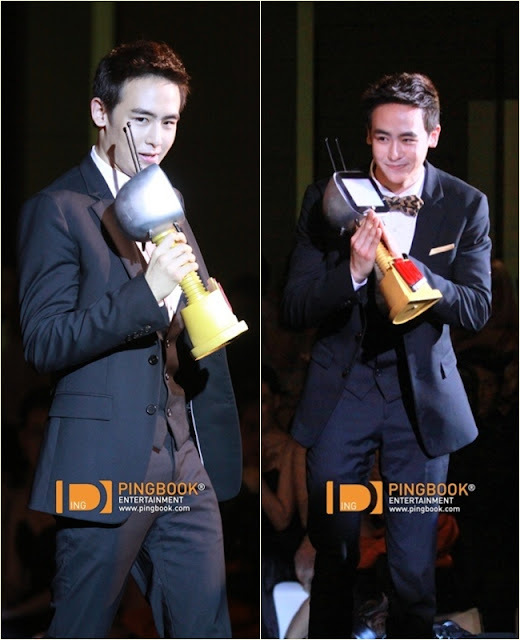 The Kerd Awards was established by Thai TV host Woody Milintajinda. He edged out news anchor Sorayut Sutasanajinda and stand-up comic Udom Taepanich. There were eight categories in the Kerd Awards: Born to be Hot, Born to be Famous, Born to be Together, Born to Grasp the Main Scene, Born to be a Comedian, Born to be a Giver, Born to be Pop and the Award of the Year. The winners were selected through fan votes. “Nichkhun has broadened his activities from being a member of 2PM, the boy band, as well as being a model for various advertisements and an actor in Thailand,” according to JYP Entertainment. Nichkhun immediately returned to South Korea after attending the awards ceremony for 2PM’s third official fan meeting. The event was held on April 1 at the Peace Palace of Kyunghee University in Seoul.